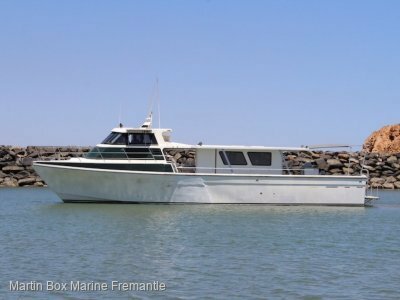 Martin Box Marine Fremantle WA	Need Insurance? AU $2,950,000	Need Finance? Need Insurance? 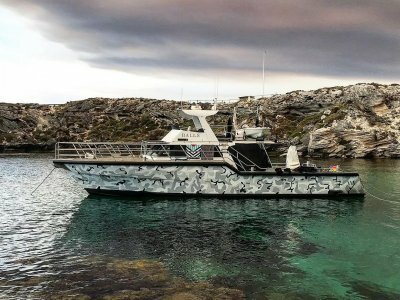 The new 6000 Enclosed Flybridge by Whitehaven is the perfect vessel for Australian waters and is proudly represented in Western Australia by Martin Box Marine. 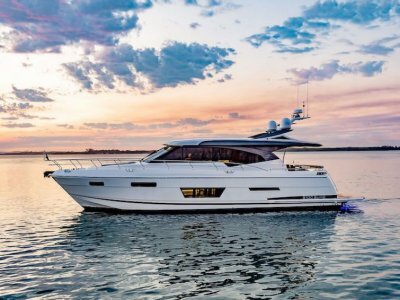 The 6000 Enclosed Flybridge offers 360 degree visibility from its elevated helm position for clear access to all of WA's waterways and features an open plan aft galley flowing onto the expansive rear deck, fully equipped for entertaining in the bays with Teppanyaki grill, fridge draws and ice makers. Activity programs are well catered for with a voluminous dinghy garage, hydraulic platform options and all the storage you could dream of in the full head height engine room which even offers a work bench with vice. Any request can be satisfied with the equipment you need at hand. 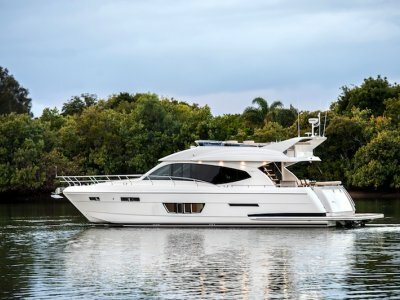 Its under the water where the 6000 Enclosed Flybridge introduces the start of her many unique features with a deep-V bow providing smooth dry performance while the hydrodynamic hull design offers wide beam stability amidships and aft, offering exceptional long range cruising fuel economy and blue water integrity. Striking exterior lines are matched by an entertainers layout, featuring indoor and flowing outdoor areas, gourmet galley and spacious three cabin accommodation. The fully appointed and well thought out helm will impress the most accomplished skipper. Powered by twin Caterpillar C18 Acert diesels for effortless cruising and capable of a sports boat sprint when asked. Presented at this years Sydney Boat Show and applauded by the West Australians in attendance. "Your Whitehaven, Your Journey"
Contact Jamie Dodd on 0418819181 to begin your journey. We take the hassle out of buying or selling your boat. Located at Fremantle Sailing Club we are Perth's longest standing dealer in new and used boats. We sell vessels from all over Western Australia and interstate. We assist you with insurance, finance, interstate delivery, detailing, servicing and berthing. Thought about selling your boat? Weather your first or your fifth boat, we are here to make your buying or selling experience an easy and professional one. Bring your vessel to us or sell it from it's home berth. We are a Western Australian BIA member, Club Marine Insurance and Nautilus Insurance agents and pride ourselves on repeat business. Weather you are buying or selling, we are here to assist and look forward to hearing from you. Twin Caterpillar C18 1150Hp Acert Twin Disk Quickshift. Full width Master Stateroom, Forward VIP Stateroom and Guest Cabin with Hi-Lo Bunks. Spacious aft galley with central island bench and all modern appliances including a four burner cooktop, Bosch microwave and dishwasher draw. Galley, cockpit and flybridge refrigeration. Two bathrooms and transom shower. Flat screen TV's and stereo system. 12/24 and 240 volts utilised. Dinghy Garage with optional Hydraulic marlin board. 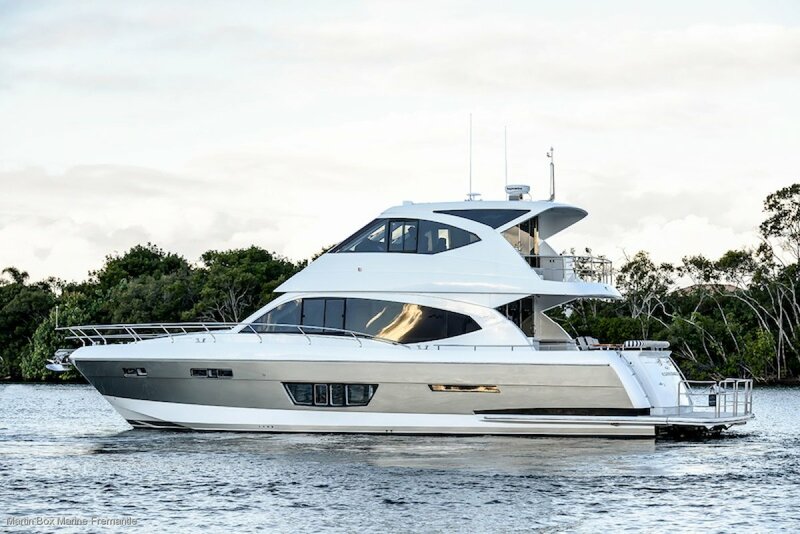 The new 6000 enclosed Flybridge by Whitehaven is the perfect vessel for Australian waters and is proudly represented in Western Australia by Martin Box Marine.